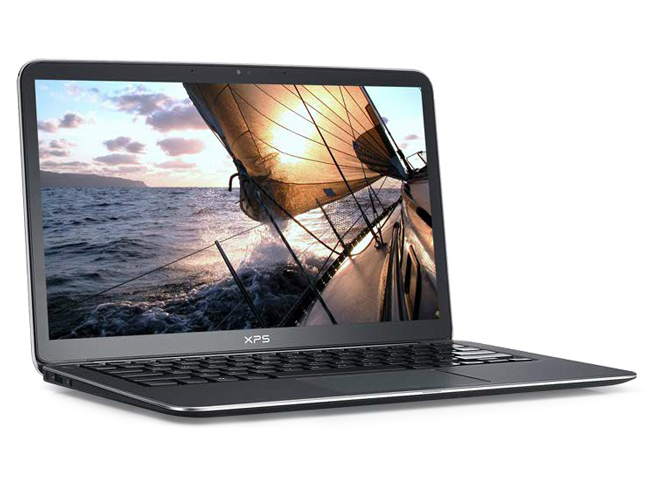 The Dell XPS 13 is impressive: in a form-factor slightly bigger than the Macbook Air 11”, Dell has managed to provide a powerful 13” thin-and-light platform that scales up to a Core i7 processor, 256GB of SSD storage and 4G as an option. At $999, it offers twice the RAM and twice the SSD storage when compared to the current ($999) Macbook Air 11″, and its battery is 50% higher as well (7.5hrs vs 5hrs). After spending some time with the Dell XPS 13 we were left with the feeling that this is actually a reasonable alternative to a MacBook Air. Yes, if you buy the XPS 13 you have to live without Apple's operating system and you have to settle for a less-than-stellar screen. But you get a VERY durable Gorilla Glass screen, carbon fiber to keep the notebook cool, and exceptional performance with great battery life. Aside from an improved screen, we could barely ask for any more from Dell’s XPS 13. It’s attractive, built superbly, and the keyboard is an absolute joy. A bigger problem concerns the price. With the top-spec XPS 13 coming in at £300 more than Asus’ Zenbook UX31, the capacious, cutting-edge SSD pushes the price above its similarly-specified rival. Don’t let that put you off, however - settle for one of the more affordable models in the range, and a slightly smaller SSD, and Dell’s XPS 13 is capable of delivering a slice of Ultrabook excellence like no other. If you're buying one, then you might want to spend money on a big SSD, rather than on a fast processor. This laptop isn't really about speed, it's about style, but it would be handy to store more files on it, especially with photos and video taking up so much space. We really found the Core i5 to be powerful enough for everything we wanted to do with it, and as nice as the i7 would be, it's not entirely necessary. There's only so cheap you can be with a thin and light chassis, Intel Core i5 or i7 under the hood, 4GB of memory and a 128/256GB SSD and Dell hasn't managed to make the XPS 13 as cheap as some competing Ultrabooks. While we've only been able to get our hands on a pre-build version so far, the Dell XPS 13 Ultrabook matches jaw-dropping design with characteristically strong performance. Although we would have liked a little more connectivity, there’s very little to fault with this device. Those looking for a long-haul machine or a machine for pounding out a thousand words at a time should look elsewhere. The Dell performs admirably in just about all areas, but doesn’t really excel in any. If style, processing power and portability are among your top considerations in a Windows laptop, the Dell XPS 13 Ultraportable should be in your short list. 2637M: Power saving ULV processor clocked at 1.7-2.8 GHz due to Turbo Boost. Offers an integrated HD 3000 clocked at slow 350 / 1200 MHz and a DDR3-1333 memory controller.» Further information can be found in our Comparison of Mobile Processsors. 87.83%: This is a good rating above average. Nevertheless you should not forget, that 10-15% of all notebook-models get a better rating.